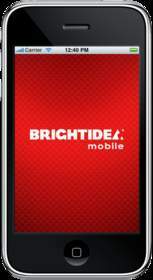 SAN FRANCISCO, CA--(Marketwire - February 16, 2010) - Brightidea, the leader in on-demand innovation management, today announced the release of Brightidea Mobile™. Designed exclusively for Apple's iPhone and iPad, as well as the Google Android platform, the native app extends the power of the Brightidea platform to mobile users. Brightidea Mobile offers an enhanced user-experience while providing unparalleled access to corporate innovation communities around the world. Developed by Brightidea Labs, Brightidea Mobile is modeled after the company's class-leading suite of innovation management products. The app supports public or private communities and is designed to support the rigorous security requirements and access controls required by large enterprises that host many online brainstorms simultaneously. "The best ideas often arise when we least expect it: at a meeting with a big client, while waiting for a flight, or when standing in line at the grocery store," said Matt Greeley CEO of Brightidea. "With the release of Brightidea Mobile, we renew our commitment to our clients, to provide the most powerful tools available for augmenting and tracking the innovation process." Users of Apple's iPhone and iPad can quickly traverse between multiple WebStorms through the familiar iPhone interface and simple navigation menu with built-in access to all accounts, campaigns, ideas, and comments. With Brightidea Mobile, users can view, post, comment, vote, and share ideas as well as use Brightidea's corporate micro-blogging feature that allows users to post and follow activity within their innovation community. One of Brightidea's first clients to roll-out the mobile app is The Nielsen Company. "We are very excited about Brightidea Mobile since ideas come anytime, anywhere," said Ann Marie Dumais, SVP, New Product Introductions Leader at Nielsen. "Now we can submit, comment, and vote on ideas right from our mobile devices and even outside the office and after work hours. We believe the viral aspects these apps will greatly increase participation in our innovation program." Brightidea Mobile can be downloaded directly from the iTunes store. To download visit the iTunes store and search 'Brightidea Mobile' or contact a Brightidea Representative. Additional fees apply. Brightidea is the market leader in On-Demand Innovation Management. Over 300 businesses around the world use its Software-as-a-Service suite to transform their employee, partner and customer ideas into a reality. The Brightidea platform is a flexible, scalable, and standards-based system that provides end-to-end tracking of the innovation process from concept through to realization. The company's software has been successfully deployed at: Adobe, Bosch, Cisco, Harley-Davidson, Experian, Emerson, British Telecom, Bristol-Myers Squibb, Honeywell, among others. Founded in 1999, Brightidea is closely held and headquartered in San Francisco, CA. For more information, please visit www.brightidea.com. Copyright (c) 2010 Brightidea, Inc. All rights reserved. Brightidea and the "Power of Innovation" logo are registered trademarks of Brightidea, Inc., and Brightidea owns other registered and unregistered trademarks. Other names used herein may be trademarks of their respective owners. About this company Brightidea Inc.